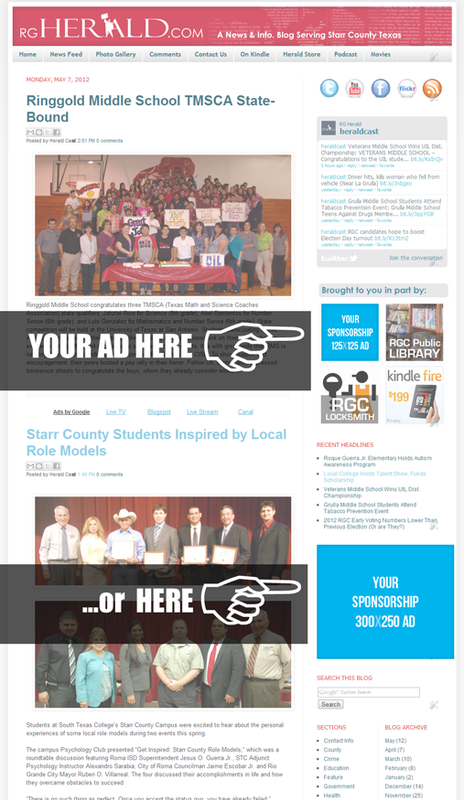 RGHERALD.com is dedicated to serving the good people of Starr County Texas. For the most part, our website has been updated and maintained by voluntary efforts using free online resources. To be able to maintain the highest quality of service possible however, we've decided to upgrade from most free services with hopes of expanding our ability to serve our community. We've concluded that a great, and mutually beneficial way to help cover some of the expenses associated with these upgrades is through local sponsorship advertising. 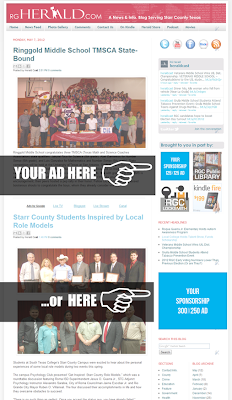 By participating in one of our sponsorship advertising programs, not only will you be helping us continue with our efforts, but your business, organization, cause or event will receive exposure to potentially hundreds of page views a day on our main Blog/Website and be accessible via our social-media outlets (facebook/twitter).